If you have a loan that you believe is a potential 504 project, contact NTCDC as early in the process as possible. NTCDC will assist the participating lender and borrower in evaluating the project’s eligibility, as well as assist in structuring the project. What if the applicant does not have a participating lender? 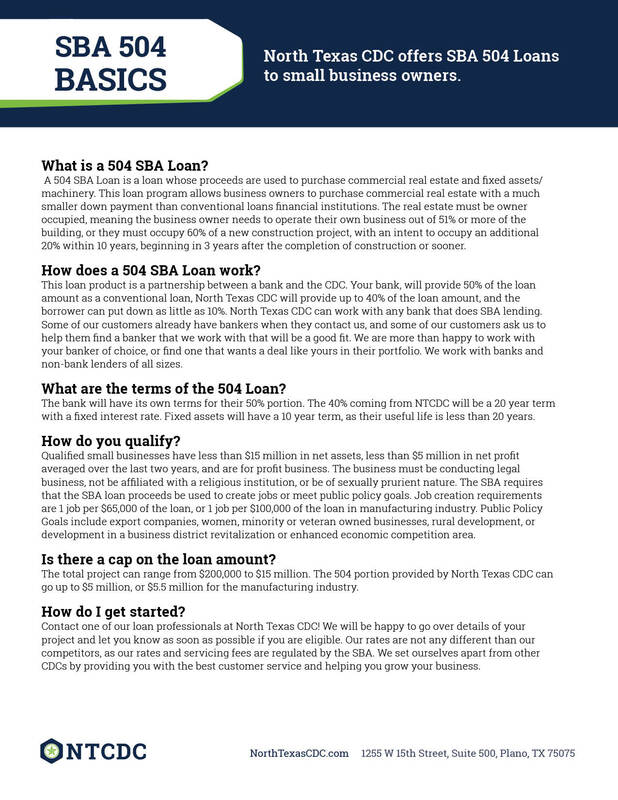 NTCDC works with lenders throughout the State of Texas. If a potential loan applicant has not already presented the project to a bank, the applicant can contact NTCDC directly. We will evaluate the project and, if viable, will contact banks that are capable of participating in the project. NTCDC does not charge the applicant a fee for assisting in locating a participating lender. At the time NTCDC begins packaging the 504 loan application, borrower must provide a $2,500 deposit. When the loan is approved by the SBA, an additional deposit of two thirds of the CDC Processing Fee is made to NTCDC. Upon funding of the 504 loan, both deposits will be refunded to the borrower. Can the borrower’s equity in the project be borrowed from another source? If an individual takes out a personal loan, such as a home equity loan, and will repay the loan through his/her personal resources, this can be considered equity in the business. 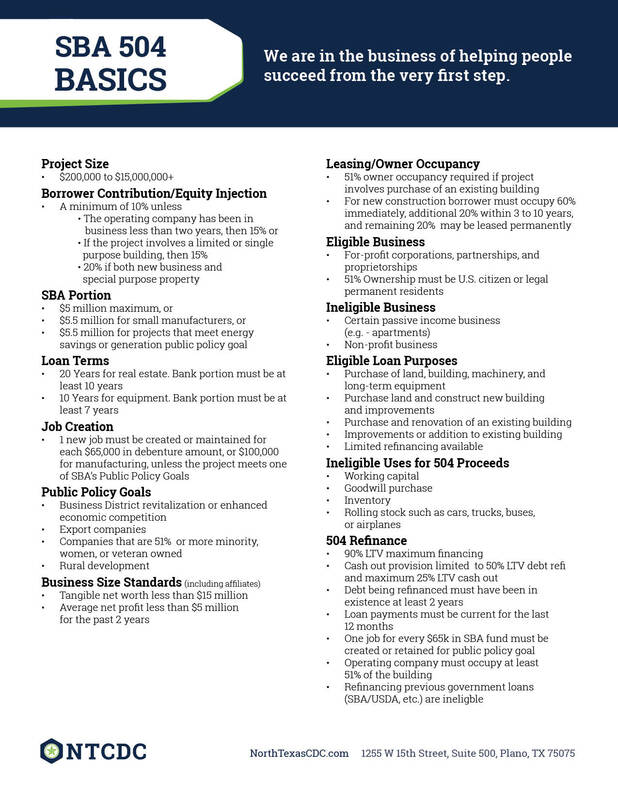 (Note that the loan is not a direct obligation of the applicant business, nor is it secured by the 504 project assets. The loan must be subordinate to the 504 loan. If the loan is secured by the 504 project assets, the loan must be in a third-lien position, and the term of the loan must be at least as long as the term of the 504 loan. Loans not secured by 504 project assets may have a term shorter than the 504 loan. There should be a “standby” period on the repayment of the ‘equity loan’. Can the 504 loan be prepaid? Yes, but only in total, no partial prepayments are allowed. The borrower must notify SBA, in writing, 30 days prior to the date of prepayment. This notification can be made through NTCDC. Is there a prepayment penalty on the 504 loan? Yes, for the first 10 years of a 20 year loan, or for the first 5 years of a 10 year loan. The prepayment amount will be the total outstanding principal balance, plus unpaid interest accruing up to the date of prepayment, plus a repurchase premium (i.e., penalty).